“Then the Son of Man approached two other fishermen who were in a ship with their father, mending their nets. Jesus called to them, ‘and [James and John] immediately left the ship and their father, and followed [the Lord]’ [see Matthew 4:18–22]. “Have you ever wondered what it must have been like to have lived in the days of the Savior? If you had been there, would you have heeded His call ‘Follow me’? “Perhaps a more realistic question might be, ‘If the Savior were to call you today, would you be just as willing to leave your nets and follow Him?’ I am confident that many would. “But for some, it may not be such an easy decision. Some have discovered that nets, by their very nature, are sometimes not so easy to leave. “Nets come in many sizes and shapes. The nets that Peter, Andrew, James, and John left were tangible objects—tools that helped them earn a living. “We sometimes think of these four men as modest fishermen who did not sacrifice much when they left their nets to follow the Savior. To the contrary, as Elder James E. Talmage, in Jesus the Christ, points out, Peter, Andrew, James, and John were partners in a prosperous business. They ‘owned their boats and gave employment to other men.’ According to Elder Talmage, Simon Peter ‘was well to do in a material way; and when he once spoke of having left all to follow Jesus, the Lord did not deny that Peter’s sacrifice of temporal possessions was . 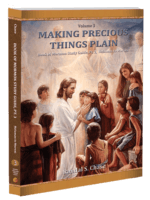 . . great’ [Jesus the Christ, 3rd ed. (1916), 218]. . . .